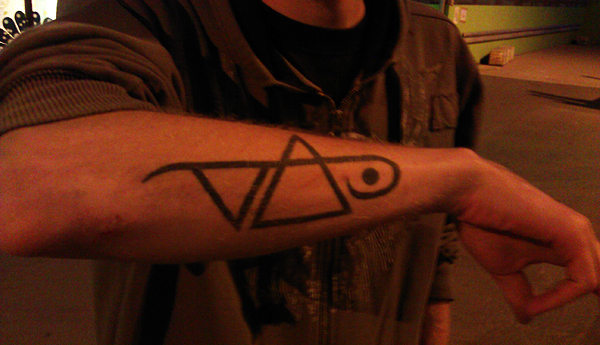 I have wanted a Vai related tattoo for a long time now. As a tribute to the man that has inspired me and been a hero to me for so many years I decided it was finally time! Here is a pic of the tattoo about 5 minutes after I got it, so keep in mind the green will be brighter once its healed the swelling goes down.this is a bad photo off of my cell phone, but you get the idea. 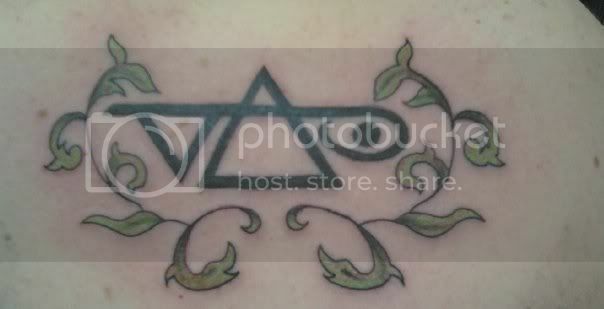 its about 9 inches wide and on my back/upper right shoulder area. it had to be black and green, I have always related that color to Steve, and it had to have the Ibanez vine design on it. I am so happy and proud to have this artwork on me as a tribute to Steve and all he has given me over the years. Cool tatt man! Well done! After the Indianapolis show on the Hendrix tour, I got the wonderful pleasure of meeting Steve. Talk about the thrill of a lifetime. I have looked up to him and idolized him for so many years, getting to tell him that was amazing. To be able to shake his hand and tell him that his music is transcendental for me, was just the coolest thing imaginable. I had to show him my VAI tattoo and he thought it was awesome. He signed his name under it and I drove the 2hours home and had my tattoo artist permanently ink it onto my back. Unbelievable. I have met so many celebrities, I have many friends that are huge stars, but NOBODY has made me feel as excited as I was the night I met Steve. He was everything I imagined and more. Just a really nice, down to earth guy who creates magic when he picks up a guitar! he is truly wonderful and I am so proud to be a fan of his and to be able to appreciate the immense talent and charisma he has. I will cherish this tattoo and my time with him forever. Wow, great tattoo! And congratulations for meeting Steve . I also met him lately and i had exactly the same feelings about him, as you. He's truly magical and amazing person and so "grounded" and normal at the same time. Greetings! This thread is kinda old but hey I don't care. I just found out that my tattoo has finally made its place to the under my skin section http://www.vai.com/wp-content/gallery/u ... ttoo_0.jpg. The picture was taken by Mattias IA Eklundh after his gig with Freak Kitchen in Kuopio, Finland. Actually I have a time from a tattoo artist to proceed with this inking to add the inlay from jem with the current tat. Hopefully with awesome results.